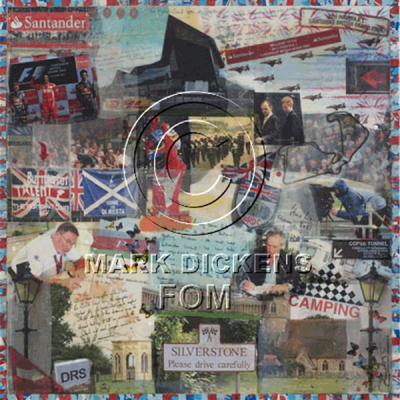 This print shows: Richard Phillips – CEO of Silverstone Circuit and Stuart Holt - Chairman British Racing Drivers Club writing their individual collaborations, Prince Harry and Alex Molina from Allsport at the Grand Prix, Fernando Alonso celebrating his much deserved win and all three drivers standing together on the podium. Mark Dickens made sure to represent the traditional British heritage by featuring the very special Band of the Queen’s Guard on the Silverstone track and the BDRC crest. He also included beautiful architectural images of the neoclassical facade of Stowe School and the charming Norman Church in Silverstone village along with the brand new pit complex at the track now known as The Wave. Finally, the famous Red Arrows acrobatic display team flies past just before the race has been captured in the print. The original painting was presented by a representative from Formula One™ Management to Richard Phillips – CEO of Silverstone Circuit during the British Grand Prix race week, season 2012.